Welcome to Alive in Grandville. We are a new church in the area, currently meeting at The Potter’s House High School, 2465 28th St SW, Sundays at 10 am. Our Sunday morning worship is comfortable and relaxed; don’t think twice about what to wear—if you like it that’s all that matters! Bring a coffee cup and we'll provide the coffee; you'll want something to wash down the donuts. We believe in a loving God that meets us exactly where we are, and that He is calling you to be part of His story. 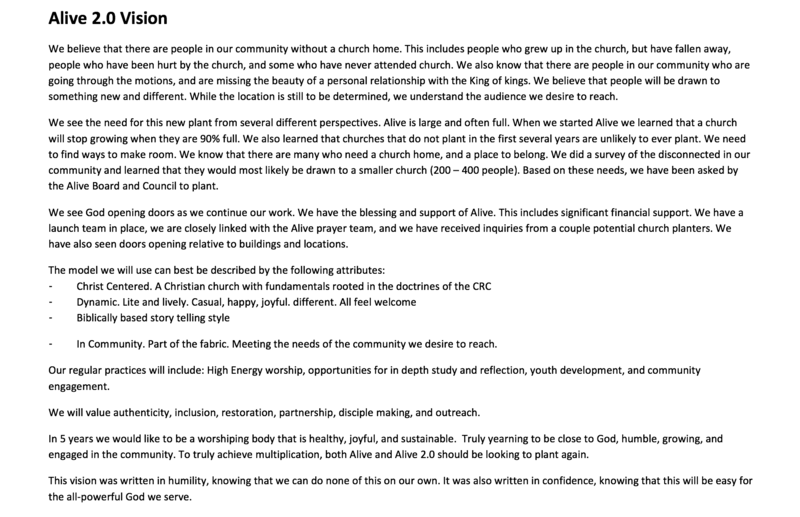 We believe that everyone has a place in the kingdom of God and in the church. You will be engaged in worship and challenged to follow Jesus in radical ways in all places all week long. We are a church plant and a campus of Alive Ministries. We currently worship with around 70 people and are in the process of renovating our permanent space located down the street in the Oakestown Center Mall. This is an exciting time to be part of a growing faith community where people will know your name and walk alongside you. We value diversity, inclusion, restoration, community partnership, disciple-making and outreach. Click to read more about our mission. Get the latest by subscribing to Alive in Grandville's E-news, or catch up by reading past issues. Questions about something in the teachings? Feel free to email Pastor Carrie.